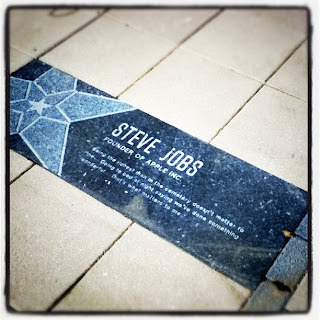 Yesterday I was thinking about Steve Jobs, and the fact that he wasn't even mentioned at yesterday's iPhone event in Cupertino. Now we know why. People who knew him will be able to eulogize his passing better than I can, but I did want to say that he has touched my life since the earliest days I was involved in computing. At my middle school in the early 80s, we had a computer room set up with Apple II+ and Apple IIe computers. It was on those machines that I first began to learn how to program, which set up a life-long affair with hardware, software and digital media that continues to this day. It didn't stop with that early Apple experience. Eight years ago I got back into Apple's products through my "half dome" iMac on which I spent many late nights running remote database queries and writing a graduate thesis. An early iPod classic provided the soundtrack to my morning and evening commutes, and more recently I have treasured my iPod touch, which has really let me improve my life and connect with people in ways that I never could have imagined just a decade ago. With this remarkable little device, I was even able to take a two-week international trip without lugging along a laptop, as I have done during earlier overseas trips. The iTouch handled email, news, gaming, utilities, photos, twitter, Facebook, and even Skype. It was on this trip that I realized that we really are transitioning to a post-PC world, and Steve Jobs is directly responsible. Last month I attended the dedication of Steve's star on the Entrepreneur Walk of Fame in Kendall Square, not far from MIT's campus. Journalist Dan Lyons (who famously created the parody blog "Fake Steve Jobs") came up to the podium to give a short dedication. The MIT Entrepreneur Center's Bill Aulet noted Lyons was reluctant to do so, as Steve was known to be in grave health. Lyons spoke to the small crowd, remarking that while Jobs had stepped down from running the company, he insisted on remaining as chairman of the board. "Even now, in his very poor, slipping health, he can not let go of Apple," Lyons said. "He has literally given his life to his vision." Lyons added that Jobs was unafraid to have his company cannibalize its own products, in the name of progress and creating great things. "Being the richest man in the cemetery doesn't matter to me ... Going to bed at night, saying we've done something wonderful... that's what matters to me."